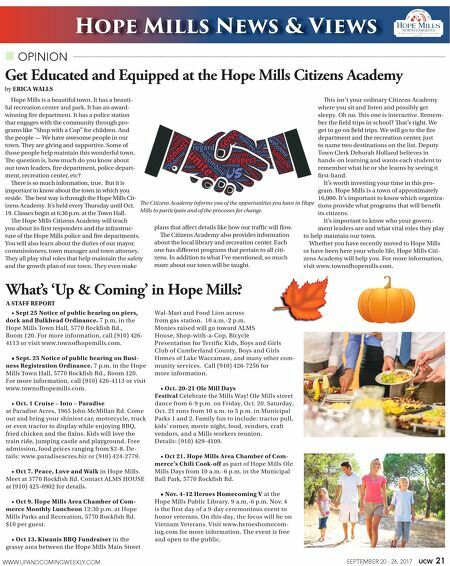 SEPTEMBER 20 - 26, 2017 UCW 21 WWW.UPANDCOMINGWEEKLY.COM Get Educated and Equipped at the Hope Mills Citizens Academy by ERICA WALLS Hope Mills News & Views Hope Mills is a beautiful town. It has a beauti- ful recreation center and park. It has an award- winning fire department. It has a police station that engages with the community through pro- grams like "Shop with a Cop" for children. And the people — We have awesome people in our town. ey are giving and supportive. Some of those people help maintain this wonderful town. e question is, how much do you know about our town leaders, fire department, police depart- ment, recreation center, etc? ere is so much information, true. But it is important to know about the town in which you reside. e best way is through the Hope Mills Cit- izens Academy. It's held every ursday until Oct. 19. Classes begin at 6:30 p.m. at the Town Hall. e Hope Mills Citizens Academy will teach you about its first responders and the infrastruc- ture of the Hope Mills police and fire departments. You will also learn about the duties of our mayor, commissioners, town manager and town attorney. ey all play vital roles that help maintain the safety and the growth plan of our town. ey even make plans that affect details like how our traffic will flow. e Citizens Academy also provides information about the local library and recreation center. Each one has different programs that pertain to all citi- zens. In addition to what I've mentioned, so much more about our town will be taught. is isn't your ordinary Citizens Academy where you sit and listen and possibly get sleepy. Oh no. is one is interactive. Remem- ber the field trips in school? at's right. We get to go on field trips. We will go to the fire department and the recreation center, just to name two destinations on the list. Deputy Town Clerk Deborah Holland believes in hands-on learning and wants each student to remember what he or she learns by seeing it first-hand. It's worth investing your time in this pro- gram. Hope Mills is a town of approximately 16,000. It's important to know which organiza- tions provide what programs that will benefit its citizens. It's important to know who your govern- ment leaders are and what vital roles they play to help maintain our town. Whether you have recently moved to Hope Mills or have been here your whole life, Hope Mills Citi- zens Academy will help you. For more information, visit www.townofhopemills.com. 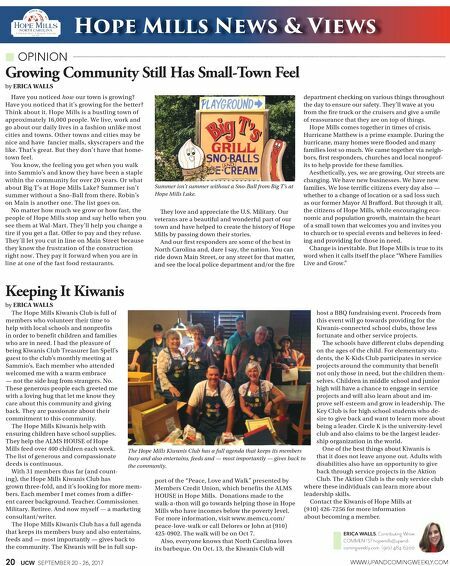 OPINION e Citizens Academy informs you of the opportunities you have in Hope Mills to participate and of the processes for change. What's 'Up & Coming' in Hope Mills? A STAFF REPORT • Sept 25 Notice of public hearing on piers, dock and Bulkhead Ordinance. 7 p.m. in the Hope Mills Town Hall, 5770 Rockfish Rd., Room 120. For more information, call (910) 426- 4113 or visit www.townofhopemills.com. • Sept. 25 Notice of public hearing on Busi- ness Registration Ordinance. 7 p.m. in the Hope Mills Town Hall, 5770 Rockfish Rd., Room 120. For more information, call (910) 426-4113 or visit www.townofhopemills.com. • Oct. 1 Cruise – Into – Paradise at Paradise Acres, 1965 John McMillan Rd. Come out and bring your shiniest car, motorcycle, truck or even tractor to display while enjoying BBQ, fried chicken and the fixins. Kids will love the train ride, jumping castle and playground. Free admission, food prices ranging from $2-8. De- tails: www.paradiseacres.biz or (910) 424-2779. • Oct 7. Peace, Love and Walk in Hope Mills. Meet at 3770 Rockfish Rd. Contact ALMS HOUSE at (910) 425-0902 for details. • Oct 9. Hope Mills Area Chamber of Com- merce Monthly Luncheon 12:30 p.m. at Hope Mills Parks and Recreation, 5770 Rockfish Rd. $10 per guest. • Oct 13. Kiwanis BBQ Fundraiser in the grassy area between the Hope Mills Main Street Wal-Mart and Food Lion across from gas station. 10 a.m.-2 p.m. Monies raised will go toward ALMS House, Shop-with-a-Cop, Bicycle Presentation for Terrific Kids, Boys and Girls Club of Cumberland County, Boys and Girls Homes of Lake Waccamaw, and many other com- munity services. Call (910) 426-7256 for more information. • Oct. 20-21 Ole Mill Days Festival Celebrate the Mills Way! Ole Mills street dance from 6-9 p.m. on Friday, Oct. 20. Saturday, Oct. 21 runs from 10 a.m. to 5 p.m. in Municipal Parks 1 and 2. Family fun to include: tractor pull, kids' corner, movie night, food, vendors, craft vendors, and a Mills workers reunion. Details: (910) 429-4109. • Oct 21. Hope Mills Area Chamber of Com- merce's Chili Cook-off as part of Hope Mills Ole Mills Days from 10 a.m.-6 p.m. in the Municipal Ball Park, 5770 Rockfish Rd. • Nov. 4-12 Heroes Homecoming V at the Hope Mills Public Library. 9 a.m.-6 p.m. Nov. 4 is the first day of a 9-day ceremonious event to honor veterans. On this day, the focus will be on Vietnam Veterans. Visit www.heroeshomecom- ing.com for more information. The event is free and open to the public.